Thyroxine (T4) is a hormone secreted by the thyroid gland (small, butterfly-shaped gland located in front of the neck). The T4 hormone is essential for growth and metabolism. T4 circulates in the blood in two forms: Free form (FT3) and Bound form. Thyroxine (T4) Total test measures the total levels (both free and bound forms) of Thyroxine hormone in the blood. Thyroxine (T4) Total test measures the total levels (both free and bound forms) of Thyroxine hormone (T4) in the blood. Thyroid Stimulating Hormone (TSH), also called Thyrotropin is a hormone secreted into the blood by the pituitary gland (a gland present in the brain). It directs the thyroid gland to produce and release the thyroid hormones (T3 & T4) into your blood. The iodine from the food stimulates the thyroid gland to make the thyroid hormones. The thyroid hormones regulate growth and metabolism. If the thyroid gland produces very high amounts of these hormones (T3 and T4), symptoms of weight loss, rapid heartbeat, tremors, sweating, anxiety, increased sensitivity towards heat, etc occurs. This is known as Hyperthyroidism. The decreased production of thyroid hormones (T3 and T4) results in Hypothyroidism which may lead to weight gain, fatigue, slow heart rate, increased sensitivity towards cold, depression, dry and thin hair, etc. 1) Bound form - It is bound to the proteins present in blood and this prevents it from entering the body tissues. The three main proteins in the blood that the T4 hormone is bound to are albumin, transthyretin and Thyroxine-binding globulin (TBG). TBG is also called Thyroid hormone Binding Globulin (THBG). 2) Free form - It enters the body tissues where it is needed and this is the active form. Hence, the T4 hormone can be measured as Free T4 or Total T4. The total T4 includes both bound and free forms circulating in the blood and can be affected by the amount of protein available in the blood to bind to them. While the total T4 test is a useful indicator of T4 levels in the presence of normal binding proteins, it is not useful when levels of binding proteins are increased or decreased. For example, increased total T4 levels can be seen despite normal levels of free T4 levels and normal thyroid function due to an increase in thyroxine-binding proteins. 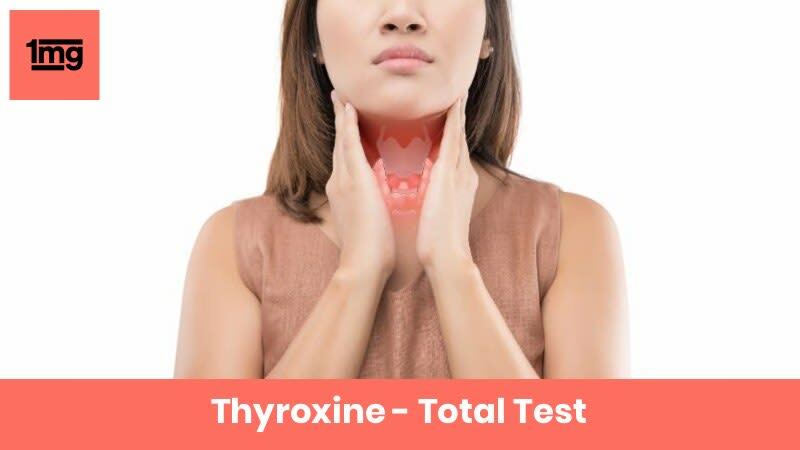 Thyroxine (T4) Total test is also done as a part of the Thyroid profile Total test which includes two more tests: Thyroid Stimulating Hormone (TSH) and Triiodothyronine (T3) Total. Values higher than normal reference range are seen in hyperthyroidism and patients with acute thyroiditis. Values lower than normal reference range are seen in hypothyroidism, myxedema, cretinism, chronic thyroiditis, and occasionally, subacute thyroiditis. Q. What tests your doctor may order to detect the thyroid disease in addition to T4 Total test? Your doctor may order the following tests: Thyroid stimulating hormone (TSH) test, Thyroxine (T4) Free hormone test, Thyroid Hormone Binding Globulin (THBG) and Thyroid profile.